An SUV with a local family of five fell from the fifth story of a parking garage and landed upside down, compressing the vehicle. The Marines quickly noticed eight local residents and two U.S. Sailors working to recover the family inside. “It was just an instinct to help pull them out of the car,” said Flores. Initially, the responders strained to open the doors to pull the family out, but struggled due to the vehicle’s capsized position. Then Flores thought of flipping the vehicle upright, and the Yokosukan responders began synchronizing the group’s efforts by establishing a cadence. Lance Cpl. Raheem F. Gilliam, who had recently learned to count in Japanese, started translating. The Marines and Sailors were then able to work together with the locals to flip the car in synch. The Marines took their experiences from the Marine Corps and applied it to the situation at hand. After the locals were pulled from the car, the Marines applied fundamental skills taught during the Combat Lifesaver Course: stop the bleeding, start the breathing, treat for shock. Once Japanese medical personnel arrived and took control of the rescue effort, the Marines went to the emergency room to ensure they did not sustain any injuries during the recovery. On the way to the ER, they reflected on what they had witnessed and thought of their loved ones at home. Tragically, three of the victims lost their lives that day. However, two young boys in the vehicle survived after being hospitalized. The Marines were awarded Navy and Marine Corps Achievement Medals at the Combined Arms Training Center, Camp Fuji, Japan, Jan. 9. Additionally, Yuto Yoshida, the mayor of the City Yokosuka, expressed interest in personally thanking the Marines and Sailors involved in the response. 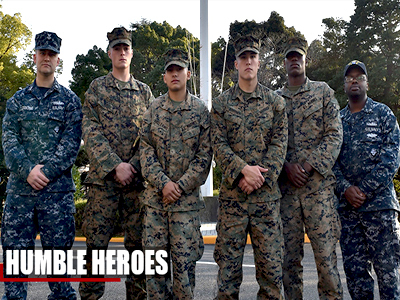 Despite their heroic actions, the Marines remain humble. The four Marines, riflemen with 3rd Battalion, 1st Marine Regiment, are forward-deployed to 3rd Marine Division, III Marine Expeditionary Force, based in Okinawa, Japan. Way to go Marines. Showing true Marine Spirit..
Good job Marines! Only goes to show how good you are in doing your job. kudos! Well done gentlemen. We need to hear more about young people doing things like this (instead of just recording it on their mobile phones!). Only a Marine/Doc would run to the cry for help. Served with the 7th Marine Medical Support Team 1972-1973, RAS 12th Marines 1973-1974. Combat Tour with the 13th EvacHosp, USAR in the Wadi al-Batin, KSA 1991.